Roastmaster Reid Patterson doesn’t always sleep in his own bed. Perched high on a secluded mountain off a steep dirt road on the south side of town, the 61-year-old house his family purchased in January off of Bridge Street feels like sacred ground; a relic of the beatnik generation. Creative ghosts howl through its sturdy steel frame (the eccentric couple who built the home were a welder and artist, respectively). Thick curls of metal—not unlike the flourishes that adorn a Madonna Inn cake—pop from unexpected places. A wrought iron industrial chicken-feeder-turned-fireplace anchors the open floor plan. Chunks of rock and salvaged wood pop out at every corner, as if the land were taking the whole thing back, eating itself. A NEW PARADIGM: Paradigm Coffee co-founder and Roastmaster Reid Patterson roasts site-specific beans from Costa Rica with a state-of-the-art roaster he purchased from friend and fellow specialty coffee nerd Jonathan Strauf, owner of downtown coffee hub Bello Mundo. On a recent sunny morning, we sat at the breakfast table with steaming cups of Patterson’s balanced Guatemalan roast. Between sips, we talked about good beans, good wine, and the unmistakable thread that unites the two worlds. Behind us, a literal wall of windows afforded a panoramic view of San Luis Obispo and the old ironworks below. I could see what Patterson meant when he said he often sleeps in “the shop” nearby. Although the property offers plenty of space to work on his business and passion, Paradigm Coffee, it can all feel a bit frenetic. And that’s without two cups of caffeine. “The house has an energy that’s really, really strong. Some people walk in and they really harmonize with it; other people, you can feel their resistance to its openness,” he said. Patterson, himself, finds that the openness can be too energizing; it keeps him up late at night. That’s why the roaster beds down in the nearby workshop. The space is rustic and unadorned save for a shining, powder blue commercial coffee roaster. He likes to be near his work. I had only known Patterson for an hour, but this already made total sense. With searching blue eyes and a shock of dishwater-blond hair, the 24-year-old is sensitive and empathic, a philosopher as much as he is a coffee nut. He’s both a chemist and an artist, and he has that contagious “millennial confidence” that comes with seeing the world through a fresh perspective. The shop, also constructed of world-weary salvaged metal, contains all of Patterson’s aspirations—aromatic dreams that smell like earthy chocolate, roasted caramel, and old wood. It is there that Patterson creates the unique specialty coffee he supplies to The SLO Foods Cooperative, Black Horse, Lincoln Deli, Morro Bay Coffee Co., Sunshine Café, and the new Lassens grocery store on Foothill Boulevard in SLO. For locals, he also offers free delivery. The offerings—single origin roasts sourced from specific growing sites in Brazil, Colombia, Ethiopia, Guatemala, and Nicaragua—reflect the land from where they flourished; not simply the country or the region, but the specific farm. In this way, Patterson is a lot like a boutique winemaker concerned—OK, more like obsessed—with terroir. Raised in rural Saratoga, just west of San Jose, Patterson worked with his parents at Mount Eden Vineyards, which eventually became the family business. Surrounded by vineyards and barrels, he grew up with the belief that having dinner as a family was just as important as exploring interesting flavors on those plates. BOUTIQUE BREW: Caturra beans from Costa Rica’s Don Pepe-Finca La Trinidad farm show notes of chocolate; toastiness; warm, sweet spice; candied walnut; and gentle berry. “I hated every second of it; but over time, I developed into someone who loved to learn; who loved the exploration of flavor, especially when it came to wine,” Patterson said. Where does the coffee come in? Well, it never really left. 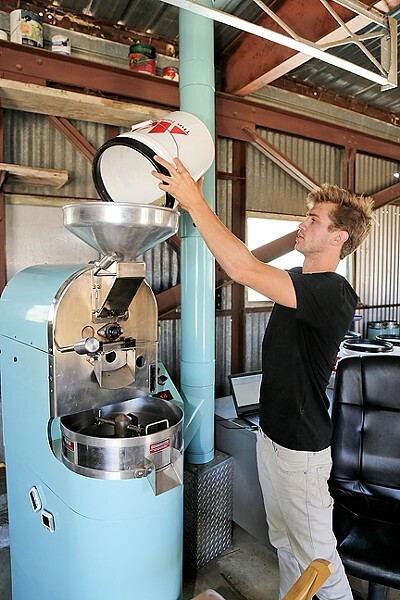 Patterson, an avid home roaster, had loved coffee for some time, first discovering specialty roasts in Healdsburg, Calif., with his friend Patrick Maloney, now a business partner. Like a fruit forward California cabernet sauvignon or an acidic vinho verde grown in Minho province of Portugal, each Paradigm coffee and its distinct flavor profile can be traced back to specific growing grounds. This is the “specialty” behind his “specialty coffee,” and why it costs more than your average gas station java. 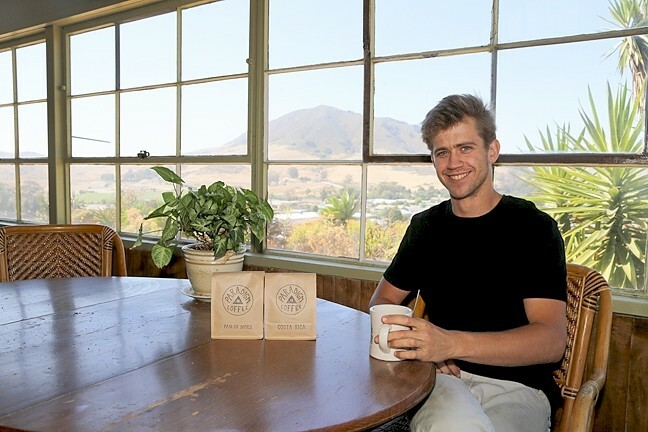 SPECIALTY SIP: Backdropped by SLO’s iconic hills, Paradigm Coffee Co-Founder and Roastmaster Reid Patterson takes a time out from roasting for a hot cup of speciality goodness. Although Patterson said his goal is to source directly from growers, right now he’s doing the next best thing: working with an extremely transparent third party supplier that does deal directly with the weathered faces behind the beans. In return, the roaster receives site-specific product and can feel confident that the growers who produced that product receive fair payouts. 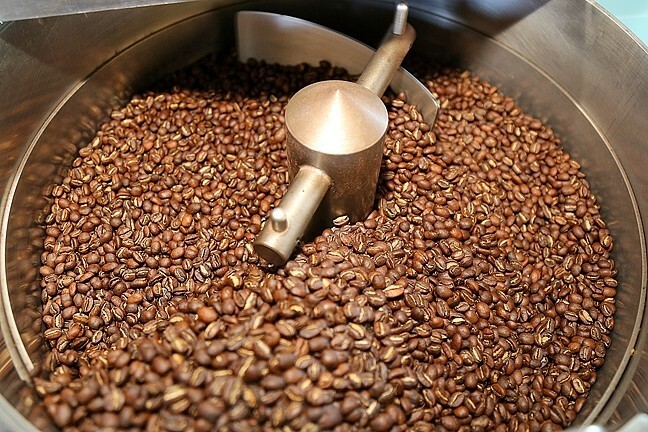 Like the use of “organic” labeling in U.S. markets, terms like “single origin” and “fair trade” can sometimes be misleading or murky; it often does not pinpoint the bean down to the exact plot of land where it was grown. “In Africa, for example, almost all farms use the cooperative model because the farms are so small,” Patterson said, explaining that with the cooperative method, a bag of “single origin” beans can come from thousands of these smaller farms spread out across the region. Instead, Patterson aims to cultivate close relationships with exceptional farmers and farms, understand the growing practices at play in those places, and pay a premium cost for those “magic” beans. “These farmers should be rewarded for their hard work to create a superior product,” he said, adding that only the highest quality beans, paired with the highest quality roasting and brewing practices, can create the highest quality coffee experience. His use of the word “paradigm” as his business name is linked to this understanding of science. DOWN, DOWN, DOWN THE JAVA HOLE: Expand your java awareness, man. Paradigm Coffee currently has a range of offerings at its website, paradigmcoffee.co. Delivery is free for residents of San Luis Obispo and you can find the beans at Lassens, SLO Natural Foods Cooperative, Lincoln Market, Sunshine Health Foods, Morro Bay Coffee Company, and BlackHorse. Patterson said he isn’t taking a dig at folks who do that (he did that back in school), but he is saying that people can change; ideas can expand. Case in point: As Patterson performed an artful Chemex pour-over that morning, I noticed the coffee in the glass bowl to be light and fiery in color, almost a reddish amber. I hadn’t ever thought to look at coffee the way you would a wine—to hold it up to the light. The balance of earthiness to rich nuttiness to acid played on my tongue. I waited, but no bitterness came. This is a coffee that I would never spike with creamer, sugar, or—God forbid—whipped cream. Apparently, I’ve transcended that realm, although—and this is key—I would never self-righteously rail against someone ordering a caramel macchiato at Starbucks. As Patterson likes to say, this whole specialty coffee business isn’t about changing what people think about coffee. It’s about an expansion in consciousness. Hayley Thomas is jittery and she likes it. She can be reached at hthomas@newtimesslo.com. Follow her epicurean adventures on Instagram @flavorslo.